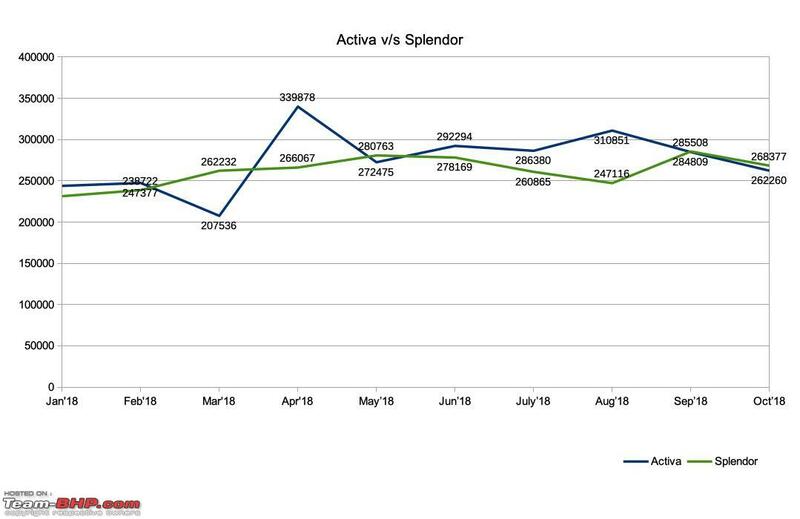 All data has been compiled from data presented by Auto Punditz. These manufacturer-reported sales numbers are factory dispatches to dealerships. 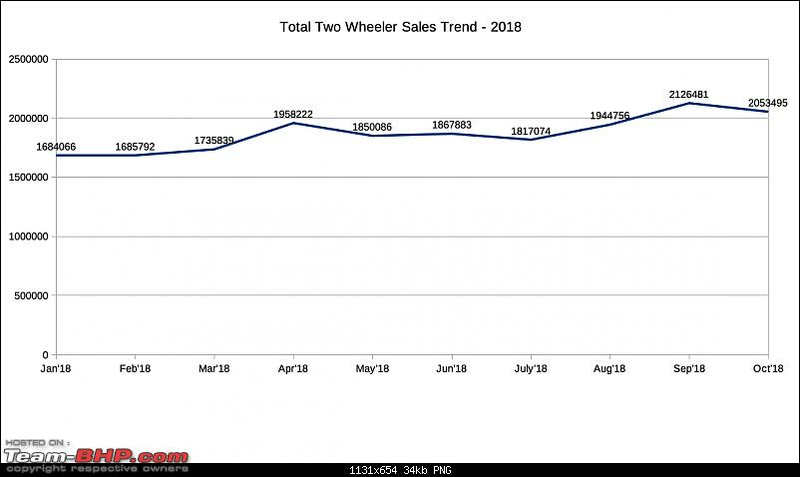 They are NOT retail sales figures to end customers. Click any picture to open a larger higher-resolution version in a new window / tab. Last edited by CrAzY dRiVeR : 23rd November 2018 at 17:29. 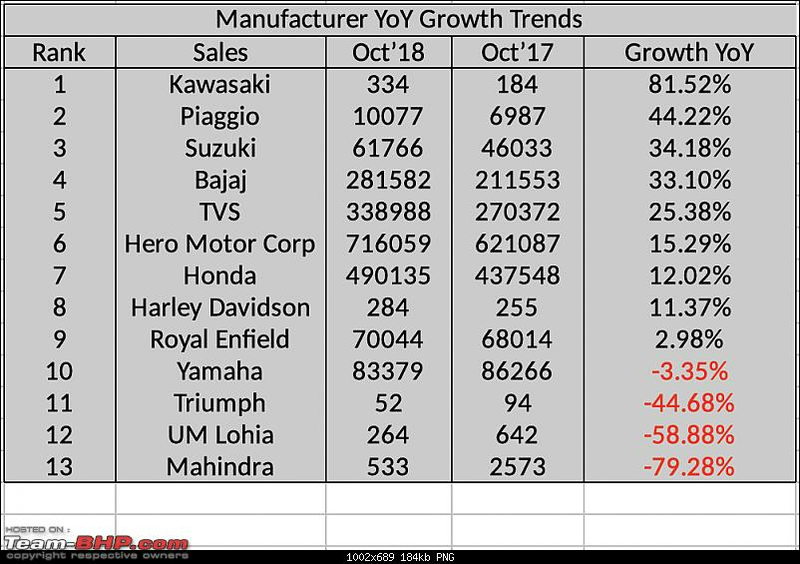 Last edited by CrAzY dRiVeR : 24th November 2018 at 01:15. Last edited by CrAzY dRiVeR : 23rd November 2018 at 22:51. Last edited by CrAzY dRiVeR : 23rd November 2018 at 17:28. Thread moved from the Assembly Line to the 2 Wheels Section. Thanks for sharing! Excellent compilation and appreciate the effort. 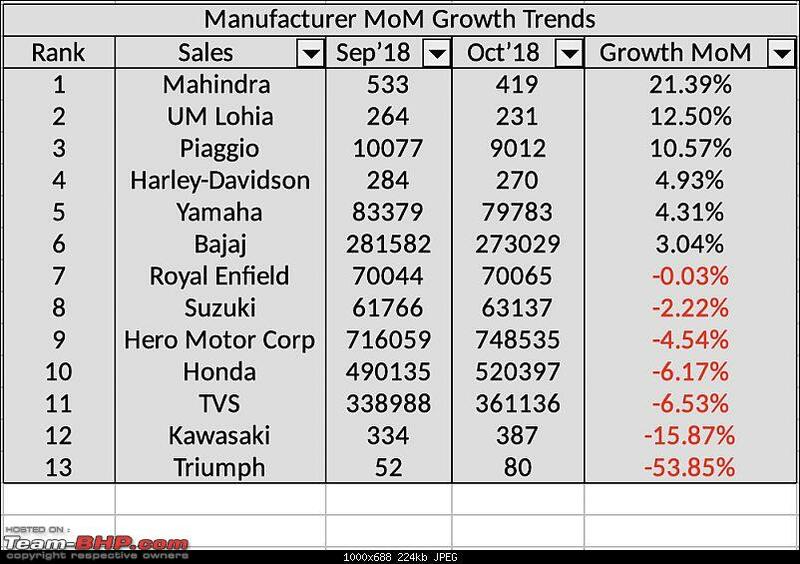 Is the resprentation of "Manufacturer MoM Growth Trends" and "Manufacturer YoY Growth Trends" correct, as it shows negative growth where as MoM and YoY numbers positive. Or am I eading it wrong ..
Great Compilation. 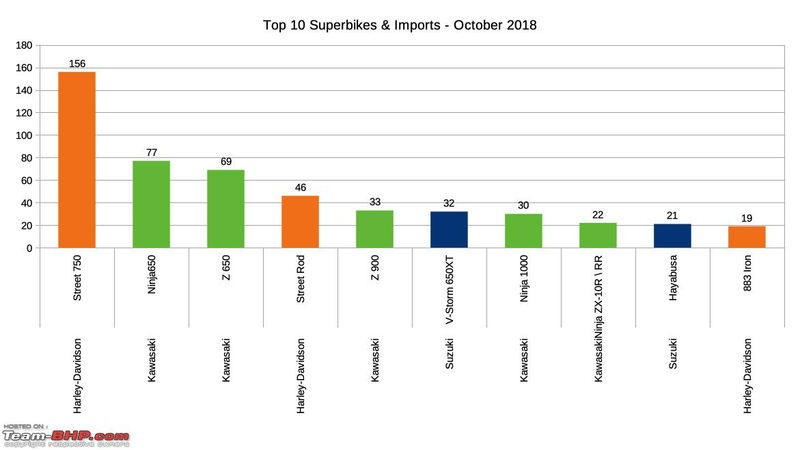 Not a single Kawasaki Versys 650 or Vulcan dispatched in last 5 months is very surprising whereas Suzuki V Strom 650 XT on a roll with 32 units dispatched. Actually, the vulcan dispatched 67 units before going blank. I think they got the dealers to just buy the vulcans upfront, they probably had a batch ckd manufacturing thing. 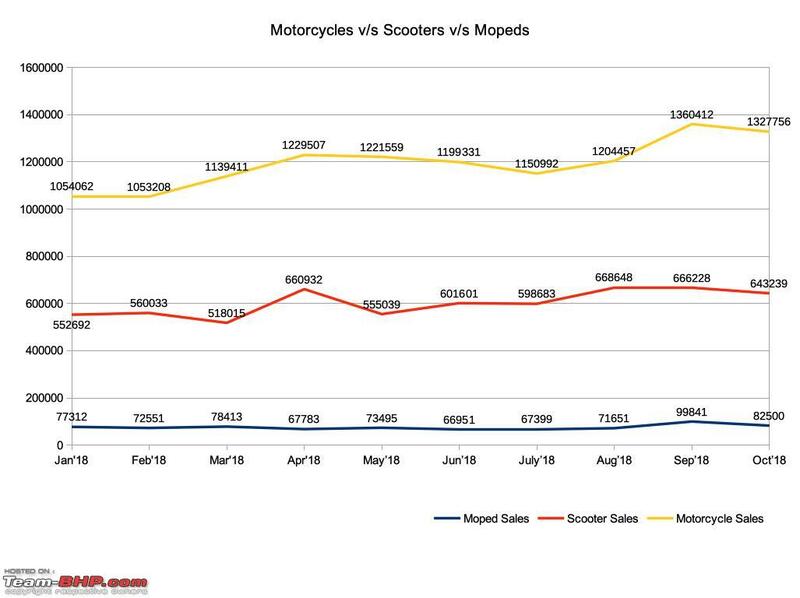 But the versys shows no such blip in its trendline, and i am wondering if it's because more used examples are being traded and hence people have stopped visiting the showrooms for the versys. This bike has been around 3 years almost now and finding examples on sale is not too difficult. 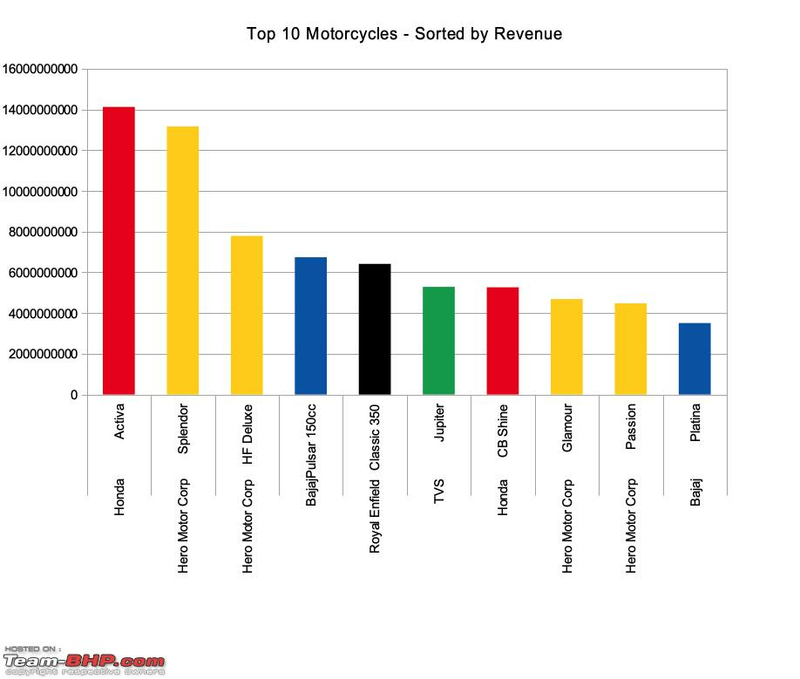 Why isn't BMW motorrad here? 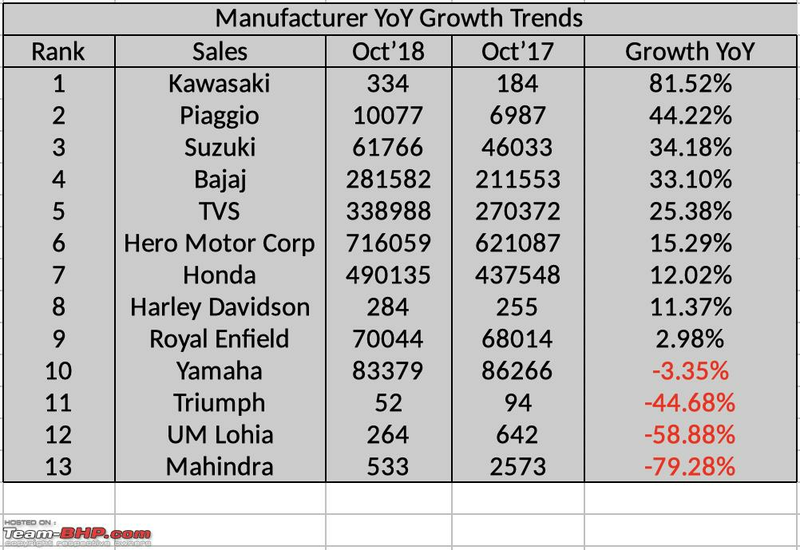 Triumph sales for the tiger series looks disconcerting. Last edited by Red Liner : 24th November 2018 at 19:18. 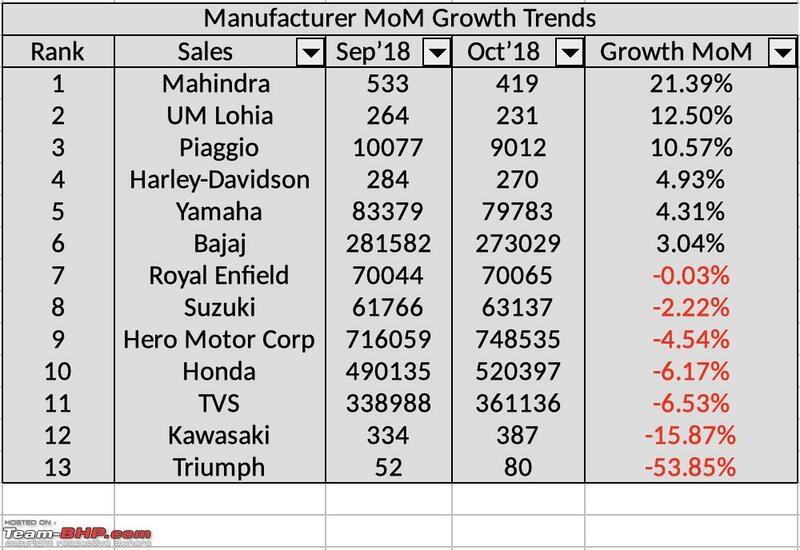 Figures seem correct - but I guess the confusion is due to the two formats for MoM (Previous first, then current figures) and vice versa for YoY. Will get that corrected going forward. 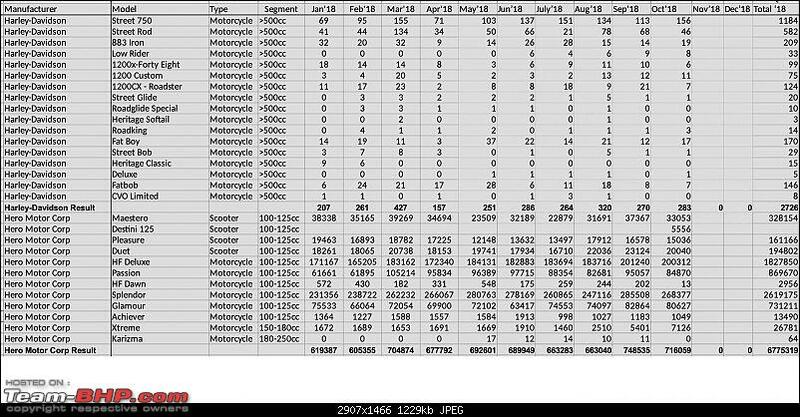 Being a Versys owner - I'm a bit curious about those figures as well. 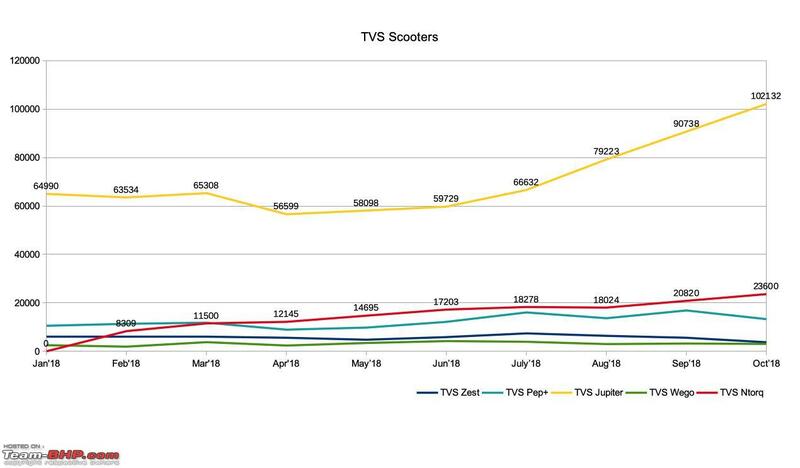 Because the Versys MY2019 grey version was launched in October, and if not for deliveries - atleast the dealer bikes were dispatched in October itself - which should reflect in the numbers. Have asked the doubt on Autopunditz site and will get back. Can't be blank next month as well, as I know atleast one person who took delivery of the new version last month. Also regarding the VStrom 650 - please note that initial months will include dealer and test ride bikes too. 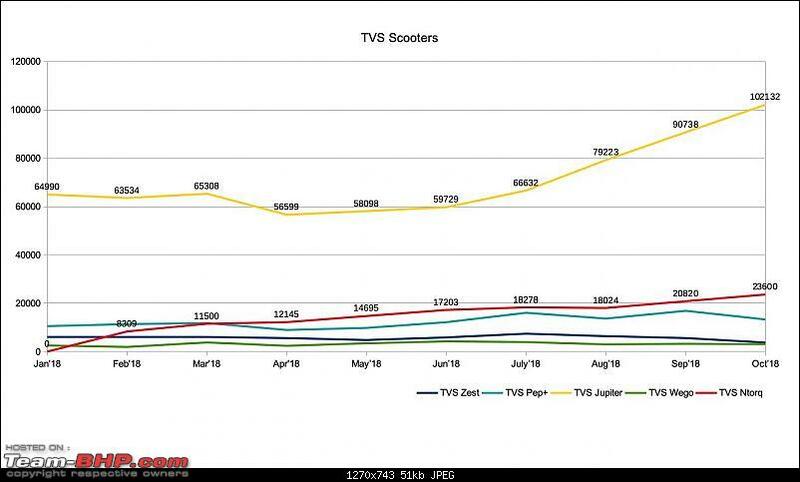 But yes - I see a much better future for it as compared to the Versys 650 now. 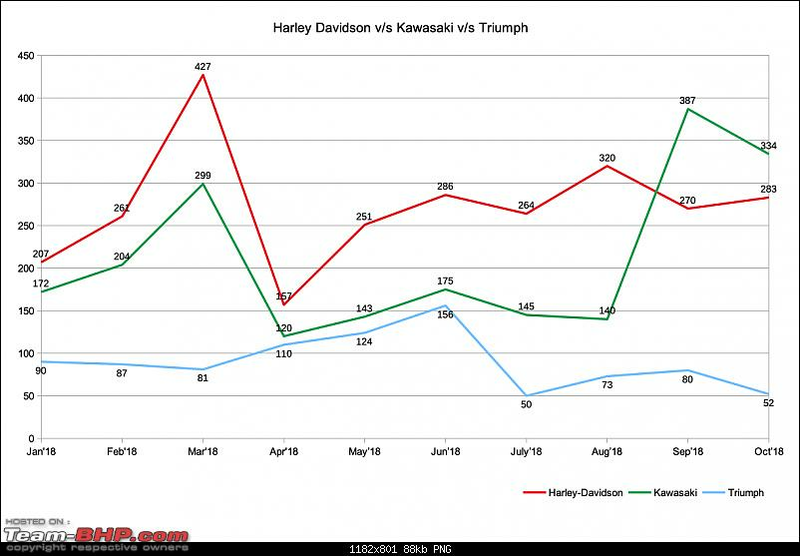 Versys was already struggling between Ninja 1000 and Vulcan 650 - and now whatever USP it had over those two is bettered by the VStrom. 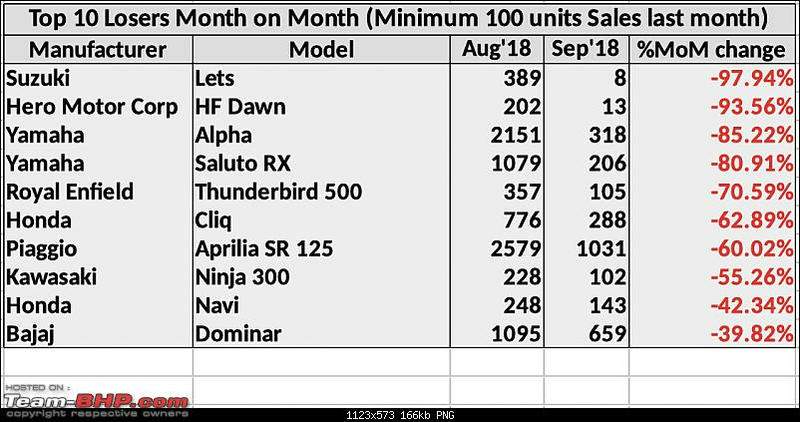 However, from a press statement released last month, they claim to have crossed 1000 units already for this calender year - though no breakup was provided. Last edited by CrAzY dRiVeR : 24th November 2018 at 19:39. Kudos to the great compilation. 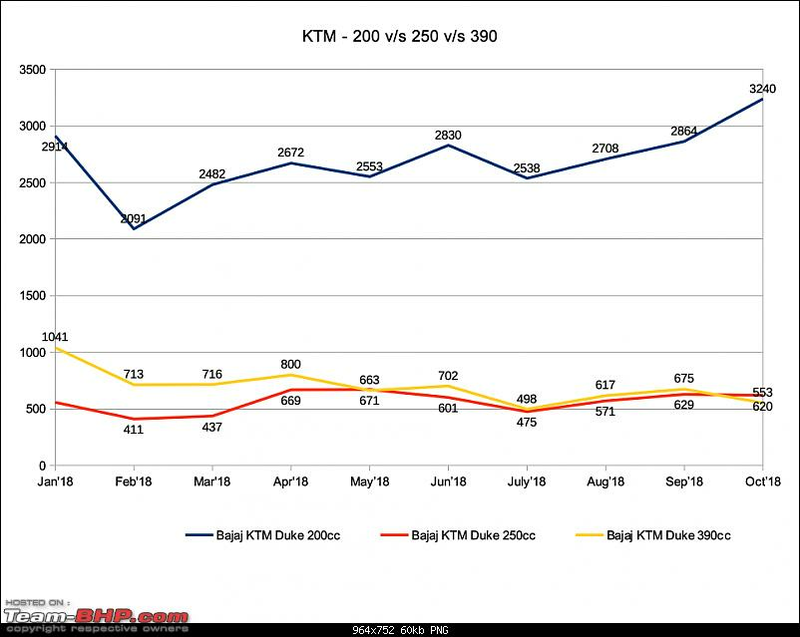 KTM Duke 200 sells more than FZ 25 even though its costlier. 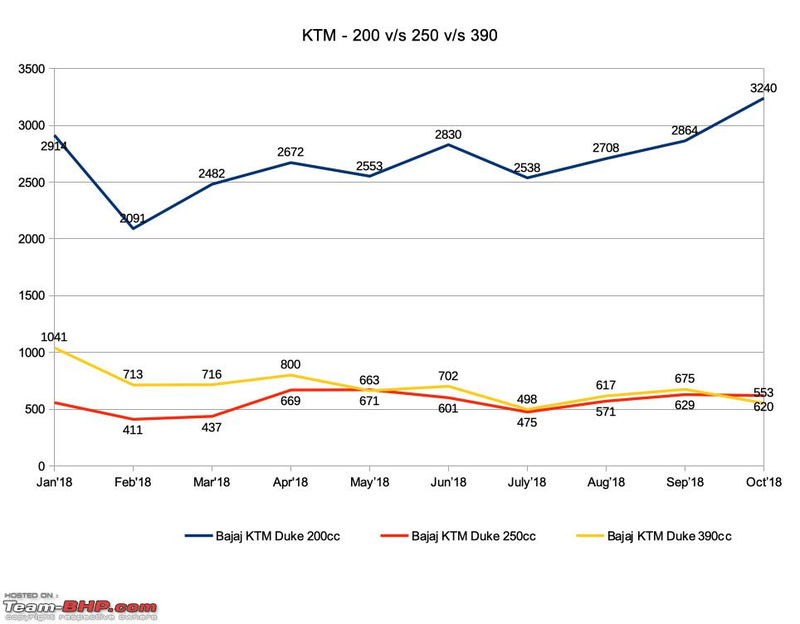 Plus, Duke 250 will also be growing more after the ABS update. 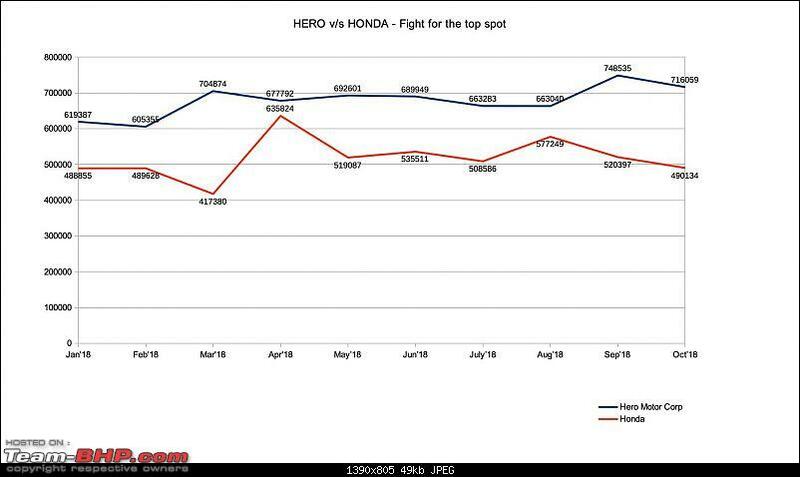 Seems to be like that Indians have started liking the Europeans in the same level as Japs. 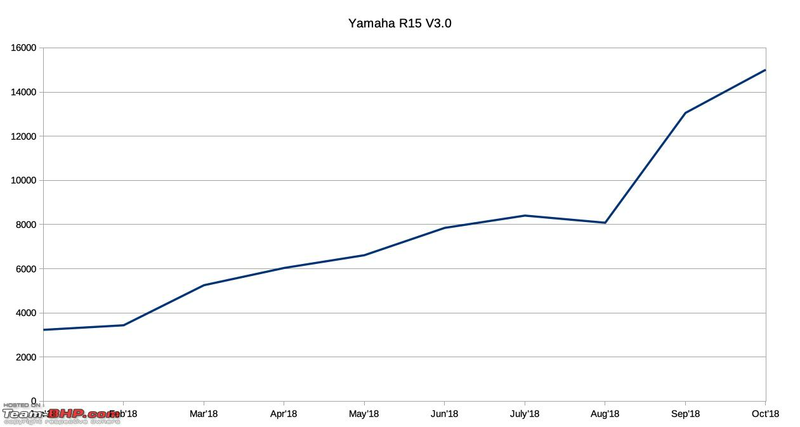 Just noticed the sales figures for R15, when a friend pointed it out after seeing this thread! 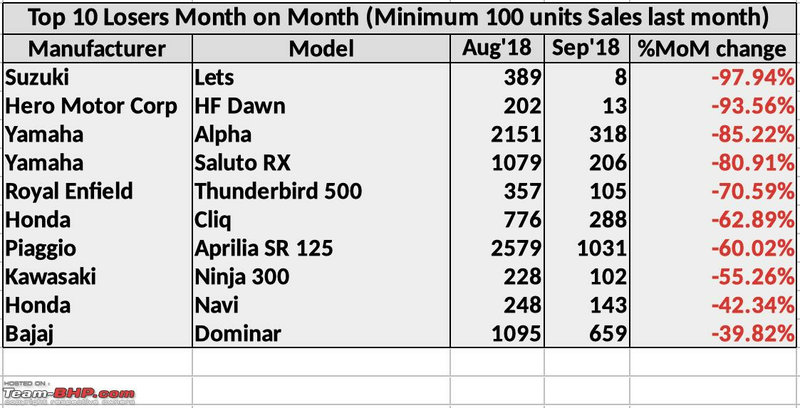 Numbers have only been climbing and climbing ever since the launch in Feb.
A quick observation, R1 sales is listed zero. 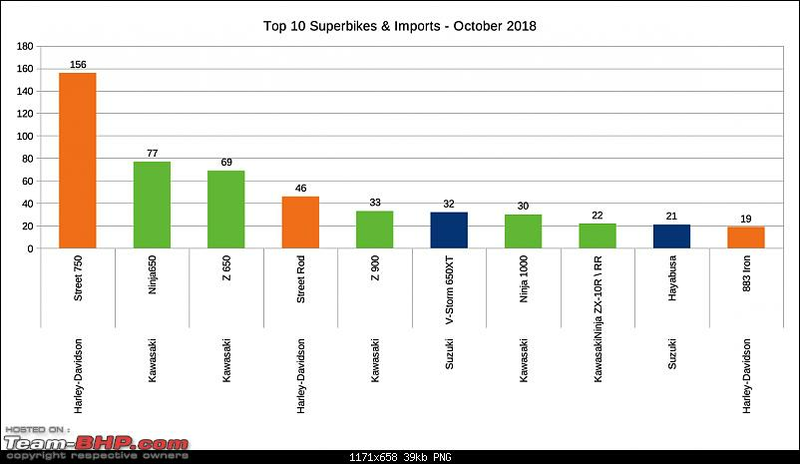 Perfect Riders dealership delivered matt black R1 in October 2018 for sure. Are CBUs excluded from this list? 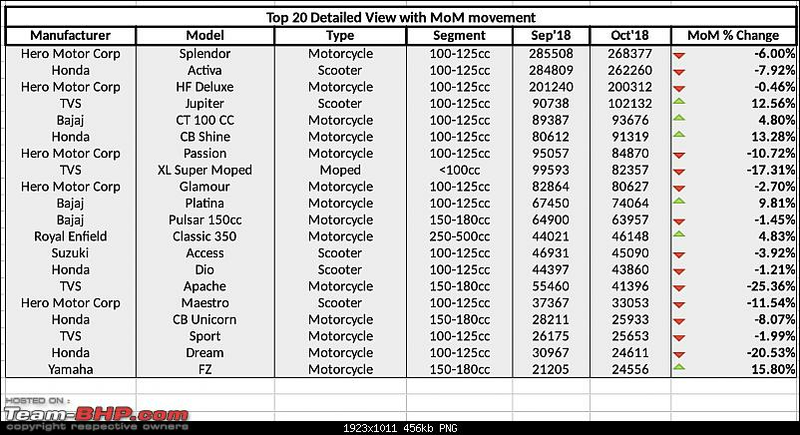 - In your first post, the column names in the top gainers and losers tables are incorrect. Instead of September to October, it says August to September. 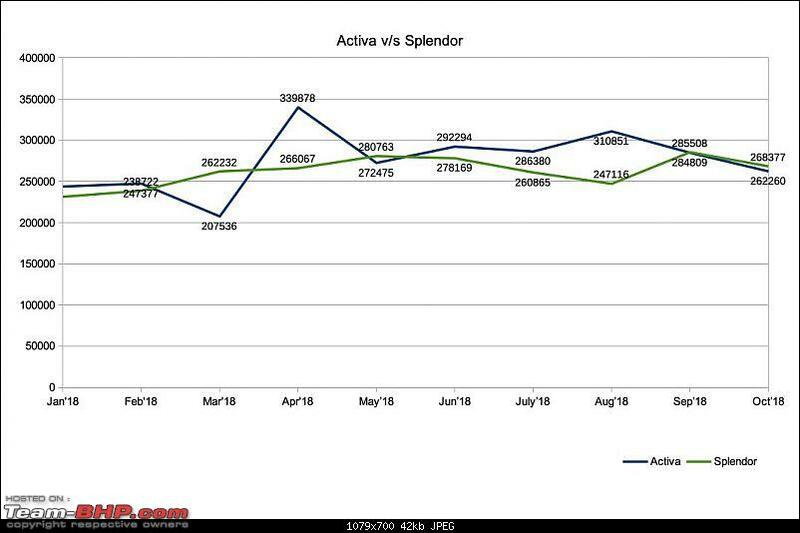 The numbers are correct for September to October. 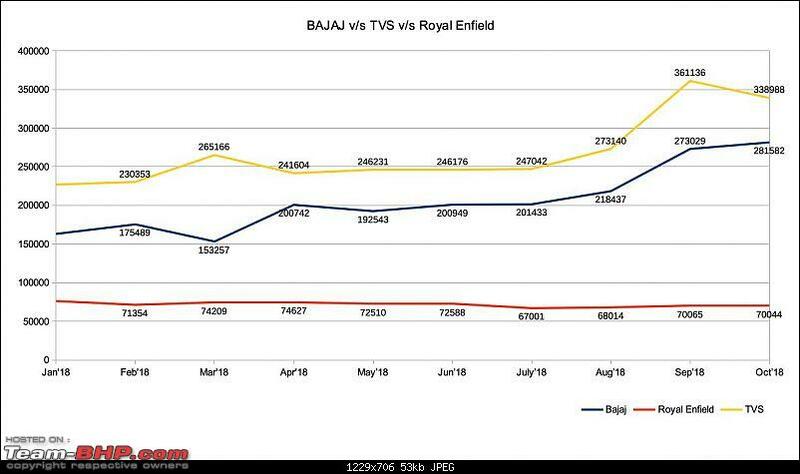 - Bajaj has done well in the last two months. 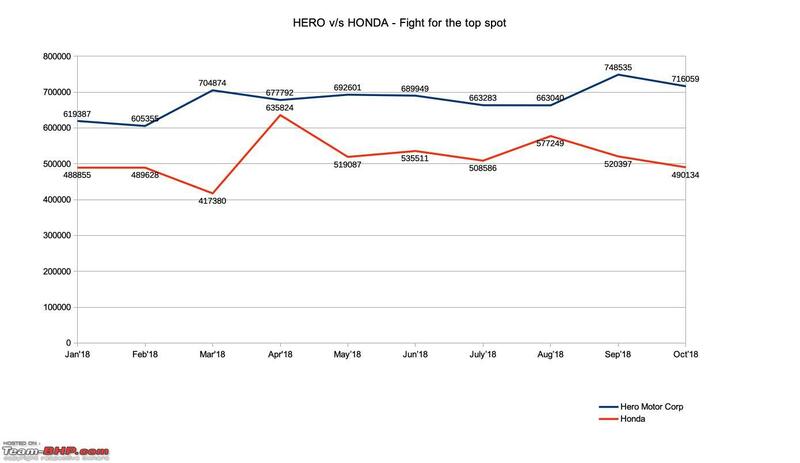 From 2 months of hovering around the 2,00,000 units mark, they have quickly moved to 2,81,582. 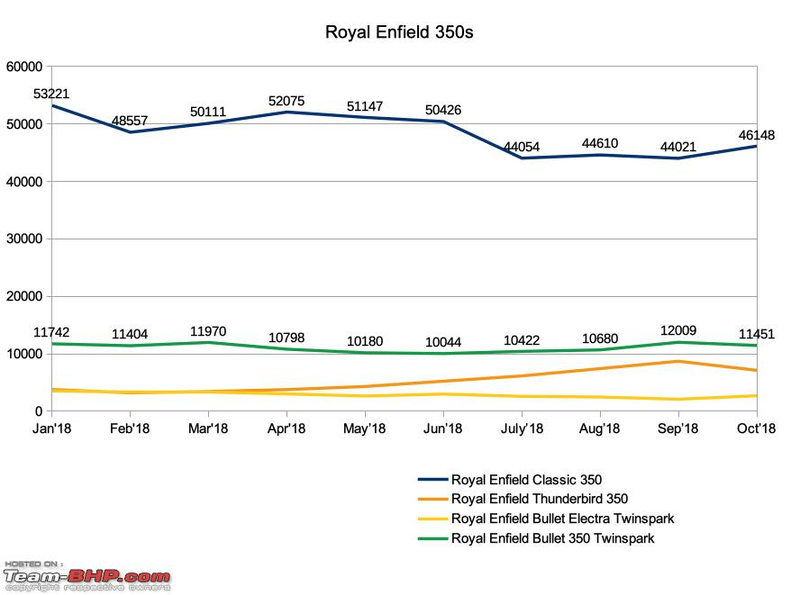 - Royal Enfield seems to have found its footing at around the 70,000 units mark. 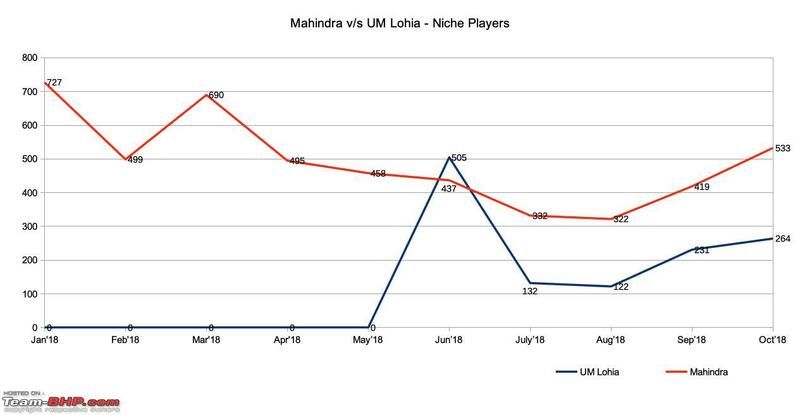 Surely they are aiming for even higher numbers. 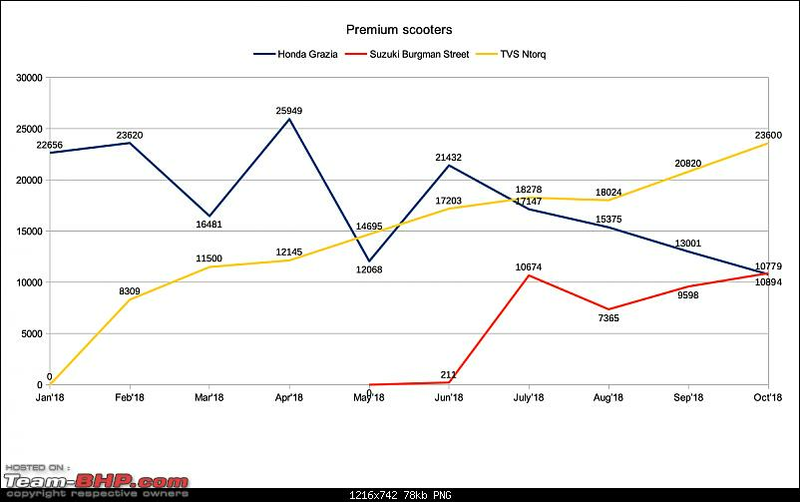 Bajaj dispatched 46.8% more (67,450 against 45,921 units) Platinas as compared to August 2018. Thats quite a leap. 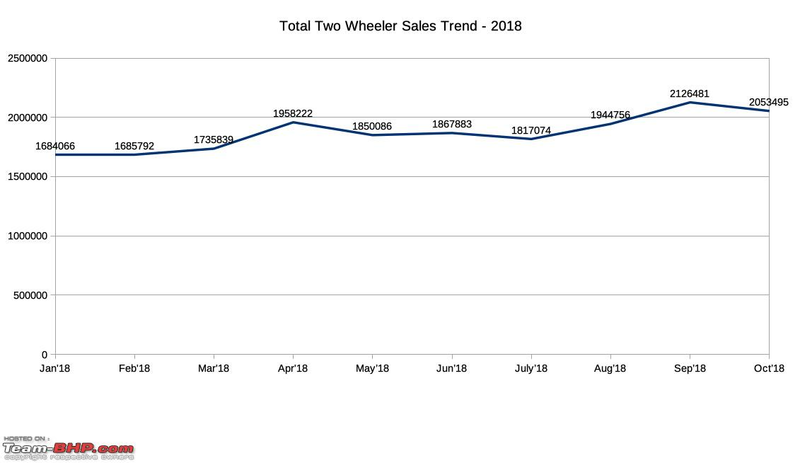 And its not like the numbers in August were a drop in the year. 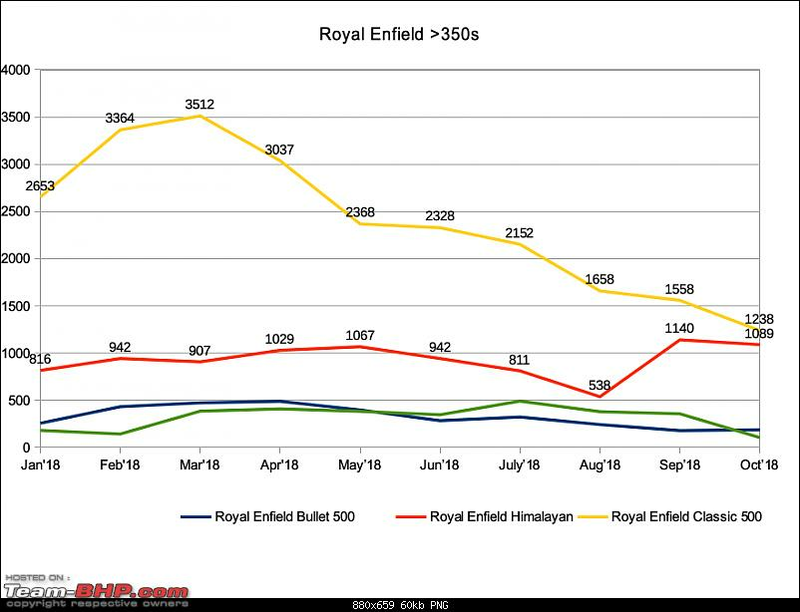 Very interesting to see how this pans out in the next few months. The Platina juggernaut rolls out. 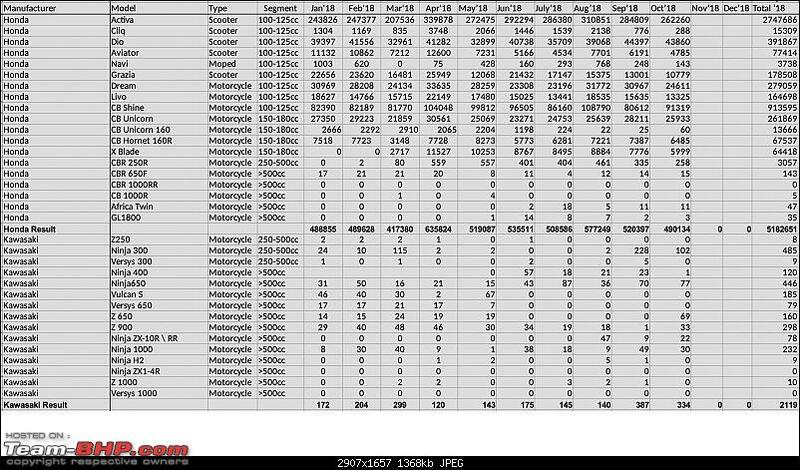 From an average of 36,125 monthly dispatches in the first half of the year, the Platina did 74064 in October. Is it the only due to the Platina Comfortec? 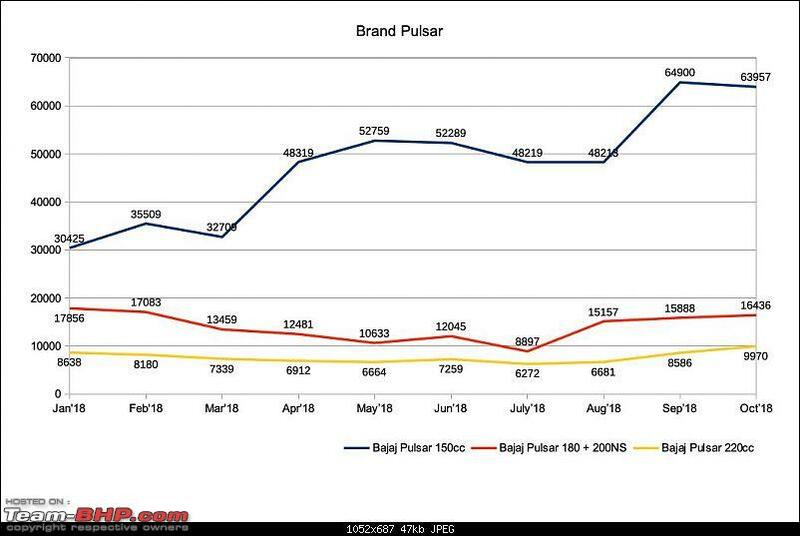 - The Pulsar 220 with 8586 units outsells the Duke 200, Duke 250, Duke 390, Dominar and V15 combined! 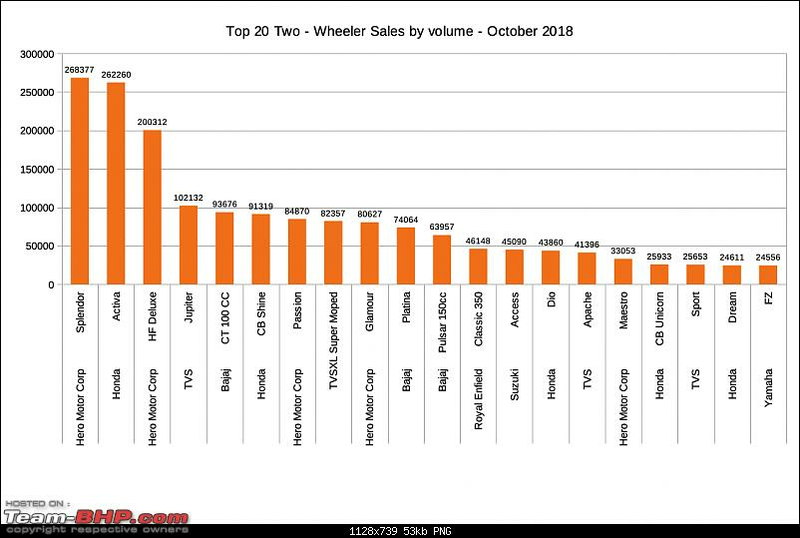 Astounding to see the old workhorse do so well so many years later. 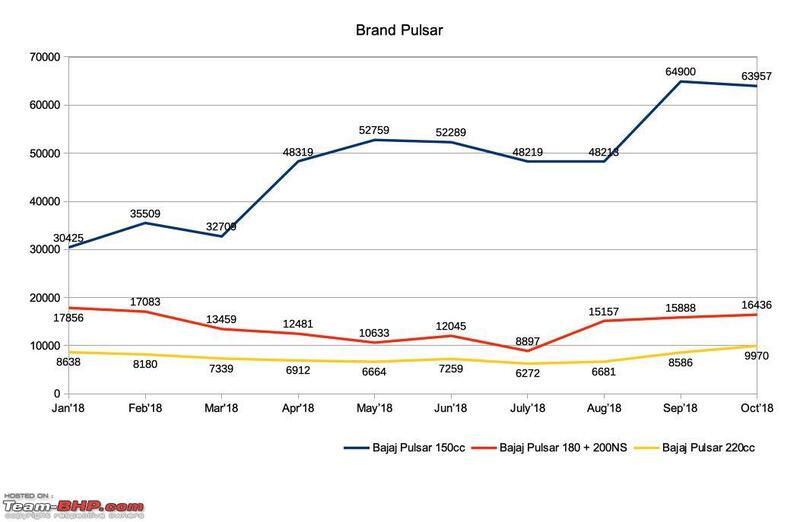 This month the Pulsar 220 did 9970 units. 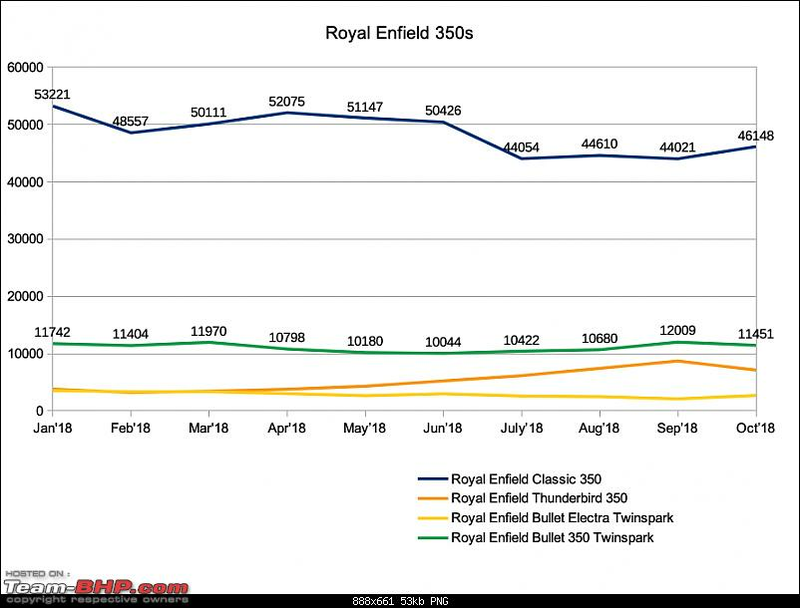 The Duke 200, Duke 250, Duke 390, Dominar and V15 combined did a paltry 6,491 units. Ouch. 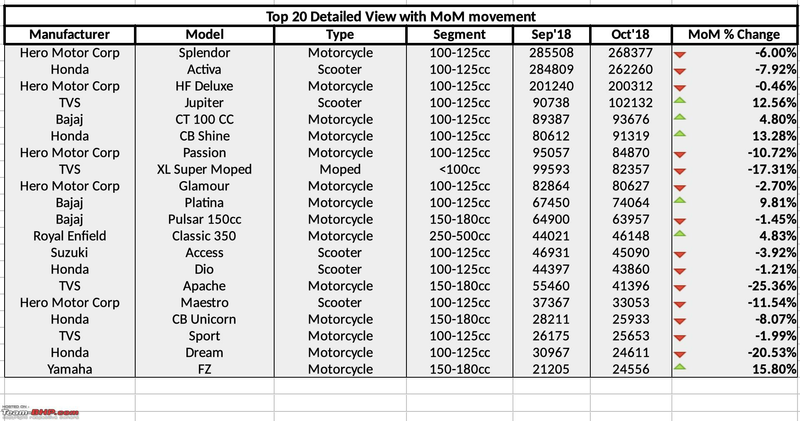 Speaking of the Dominar, its sad to see such a competent bike not do well in the market. 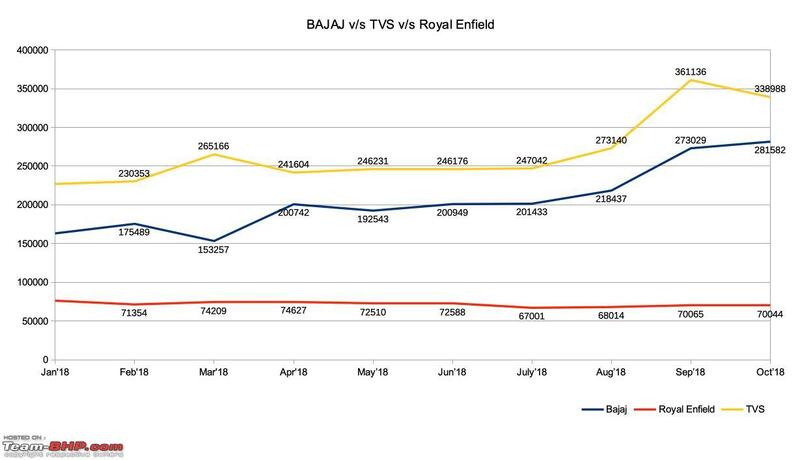 That's one dud that Bajaj's marketing campaign can take full credit for. 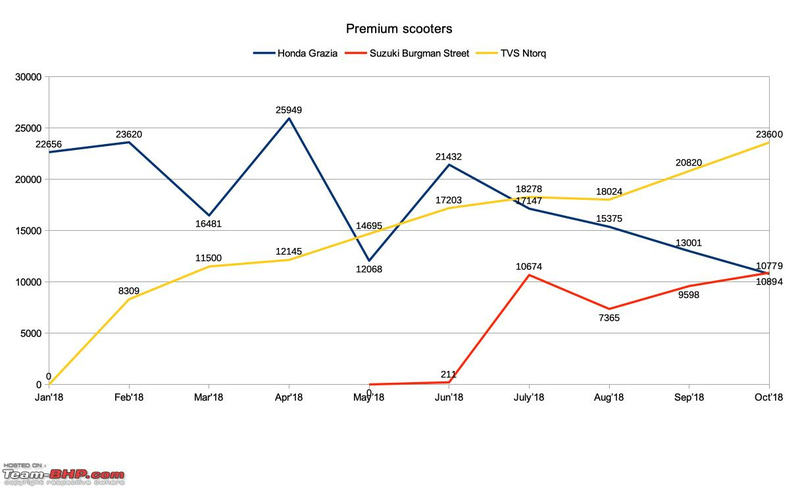 Meanwhile I just hopped on over to the Facebook page of the Silicon Honda (Bangalore) dealership and found that they have delivered several Fireblades in 2018. 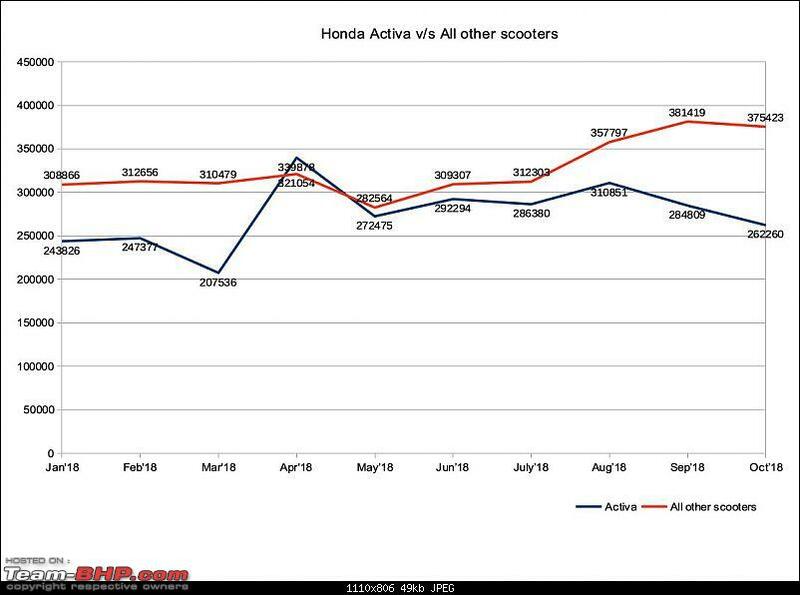 - Honda's CBR1000RR sales figures for the year are definitely wrong. 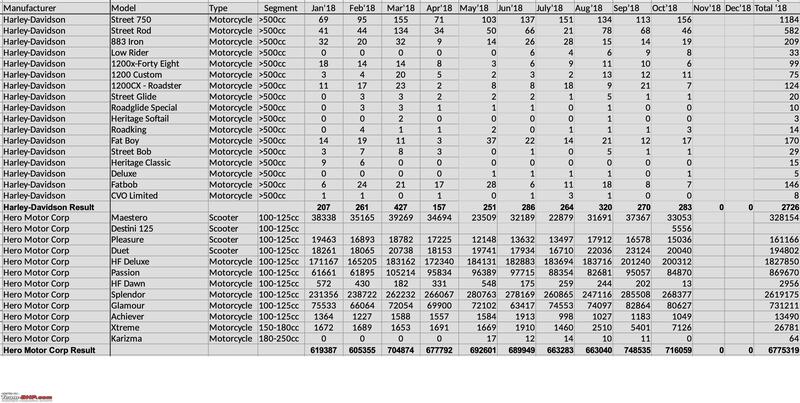 - Did the Versys really have zero dispatches in the last 5 months? 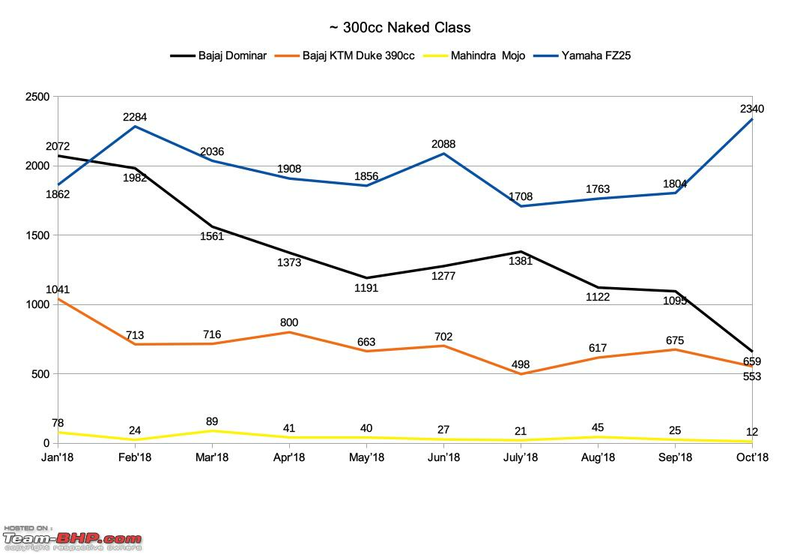 That must certainly be worrying the boffins at Kawasaki India. 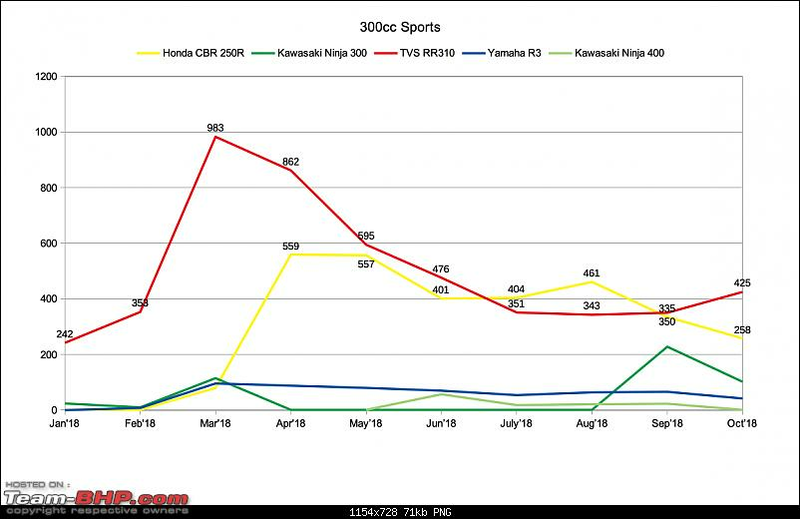 - Im surprised by the big spike in Z900 dispatches. 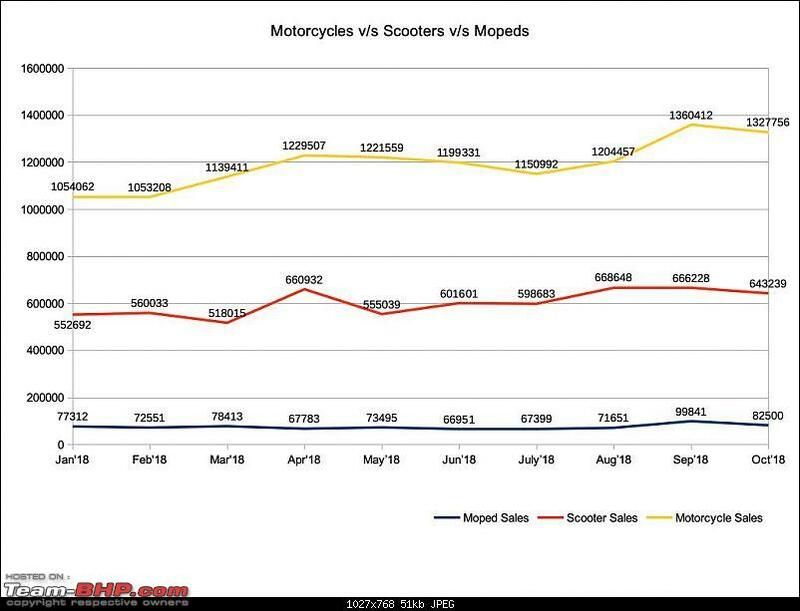 I doubt their dealers are sitting on that many orders so its likely the company has pushed inventory onto dealers. 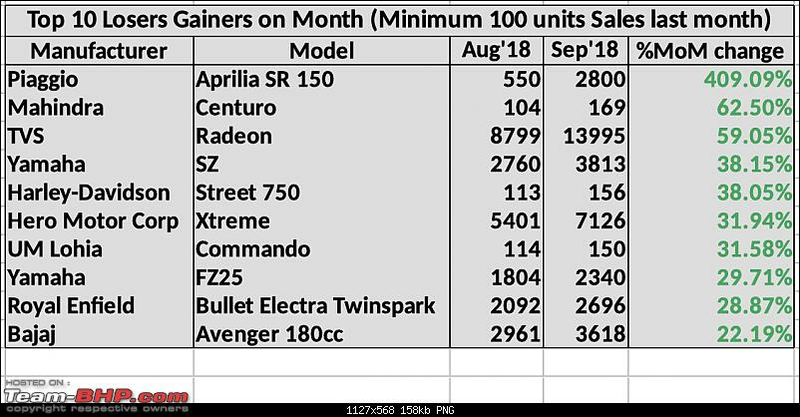 Given that its already November, I strongly suspect that there are going to be a bunch of left over 2018 stock of Z900s that might have some discount come Q1 2019. 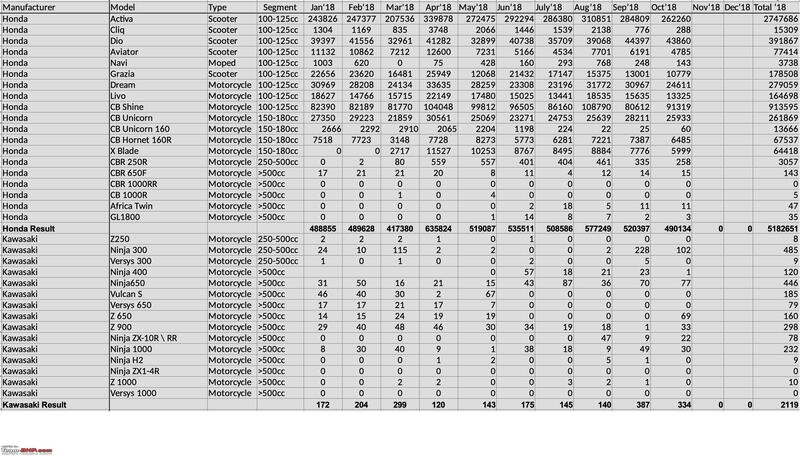 - Only 78 dispactches of the ZX10R all year after they announced their ground breaking pricing? Are people with bookings really still waiting all these months later? 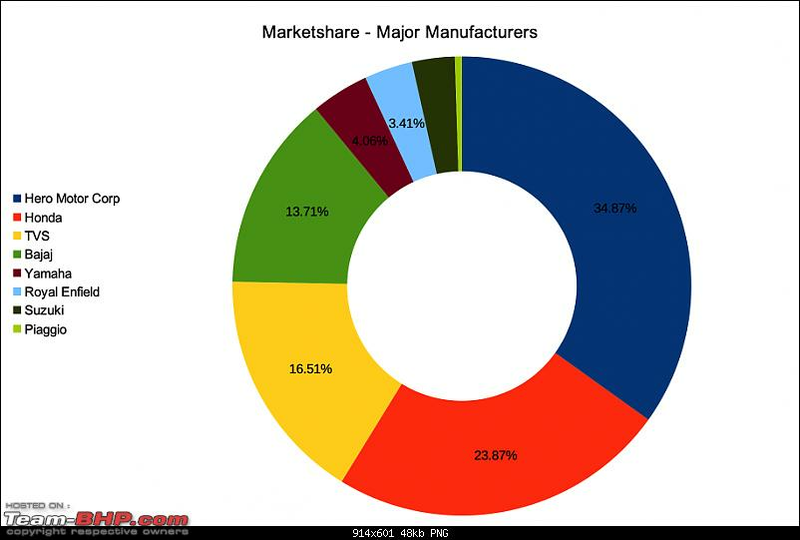 Or is the market genuinely this small? I remember predicting a run of 100 units. 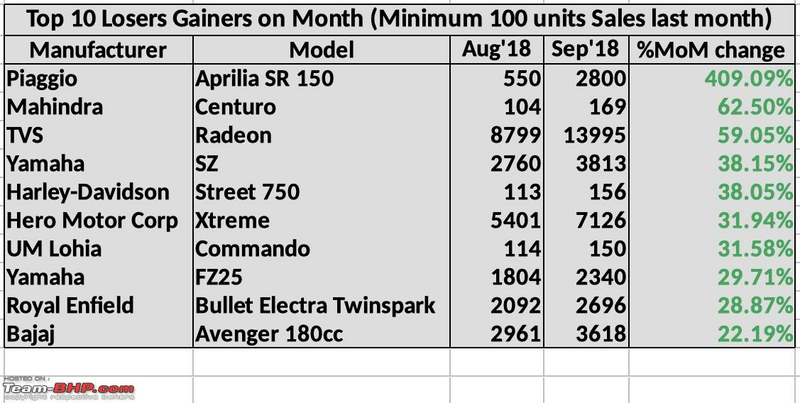 - After 4 months of the SR125 outselling the SR150, Aprilia seems to be pushing the SR150 again. Higher purchase price and higher profits. Win win. 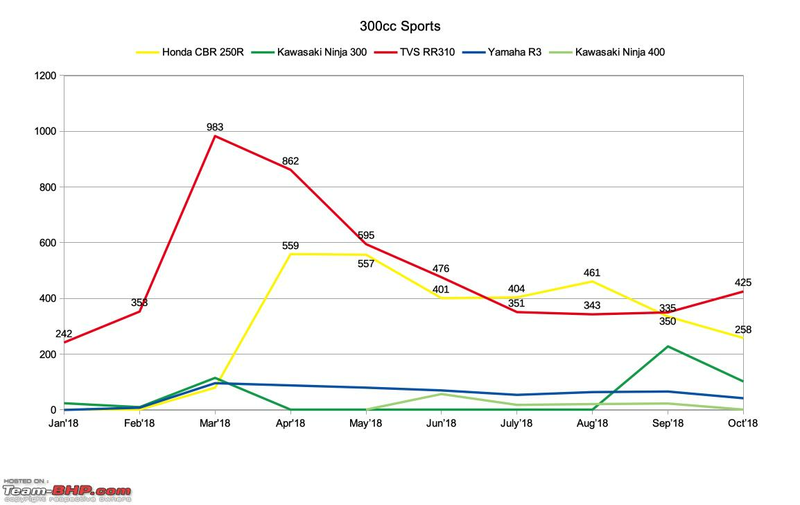 - Bad month for the RE 500cc offerings. 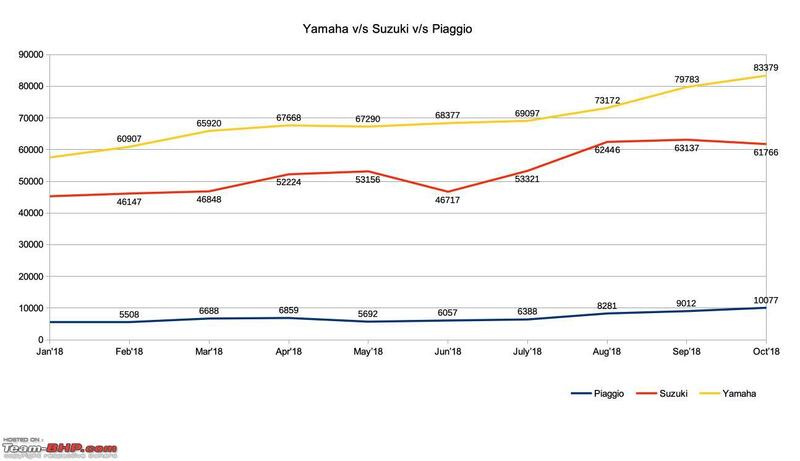 They have sold the same number of bikes overall as compared to the previous month but they have sold a lot more of the 350 cc bikes. 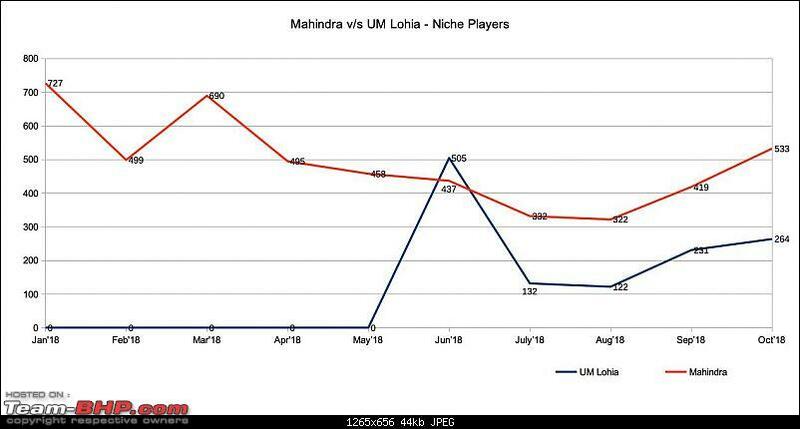 Not a very profitable month for them. 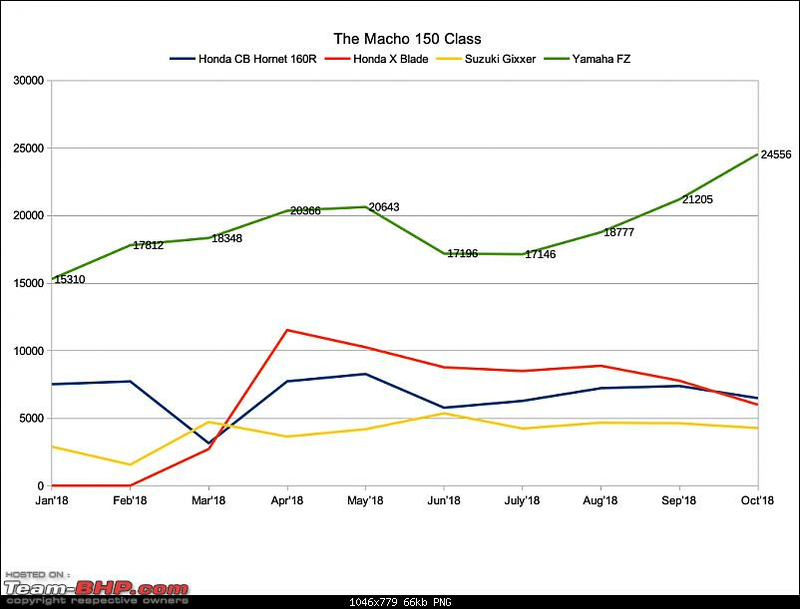 Then again, they will be sitting on a ton of cash with the 650 twin bookings so I doubt they will complain. 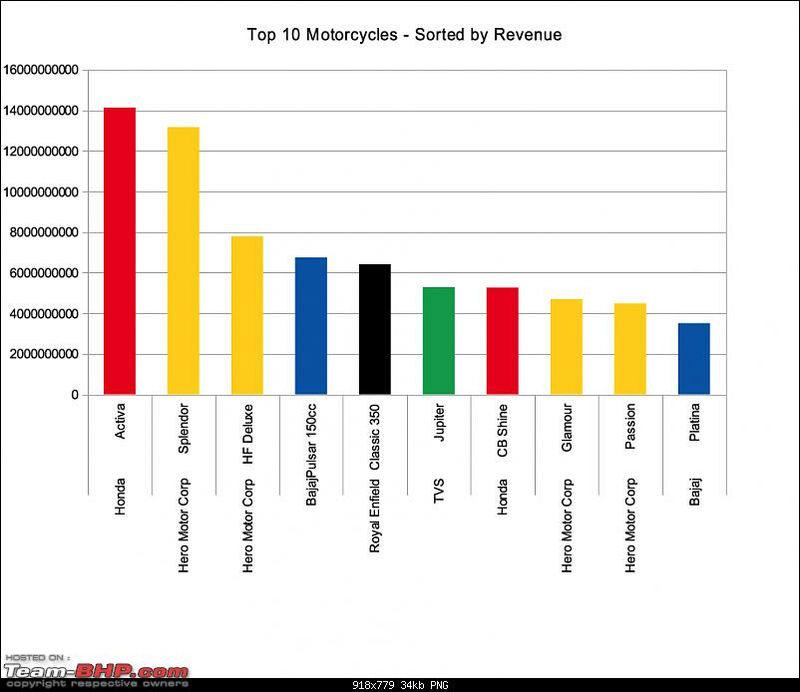 - The V Strom 650XT (not Storm ) makes things very interesting. 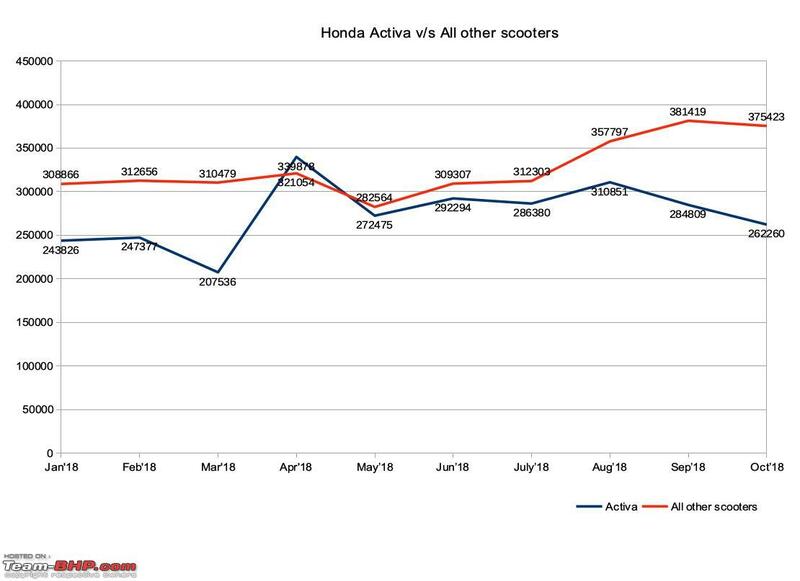 If they can continue the momentum and allay the concerns on frequent services and associated expenses, the bigger adventure bike manufacturers need to be really worried. 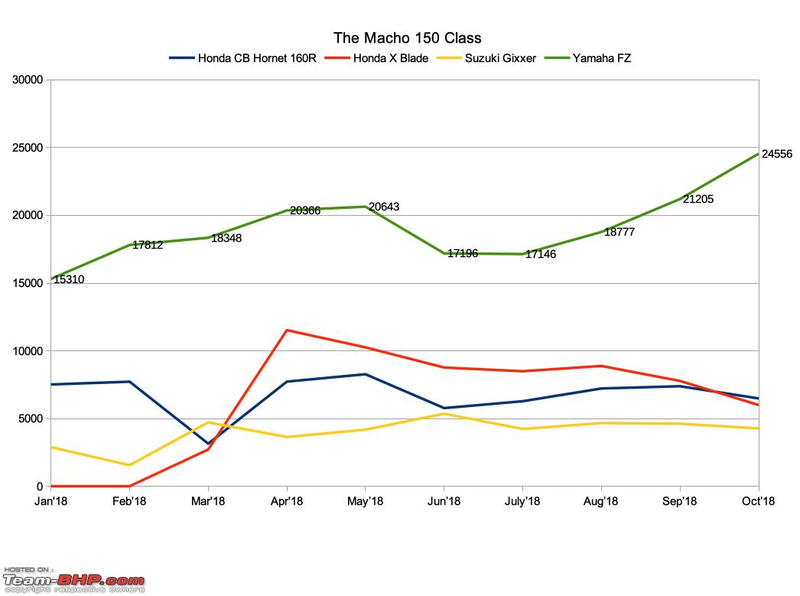 - The evergreen Hayabusa sells an average of 17 motorcycles a month while the ZX14R has done zero in 2018. Thats amazing. 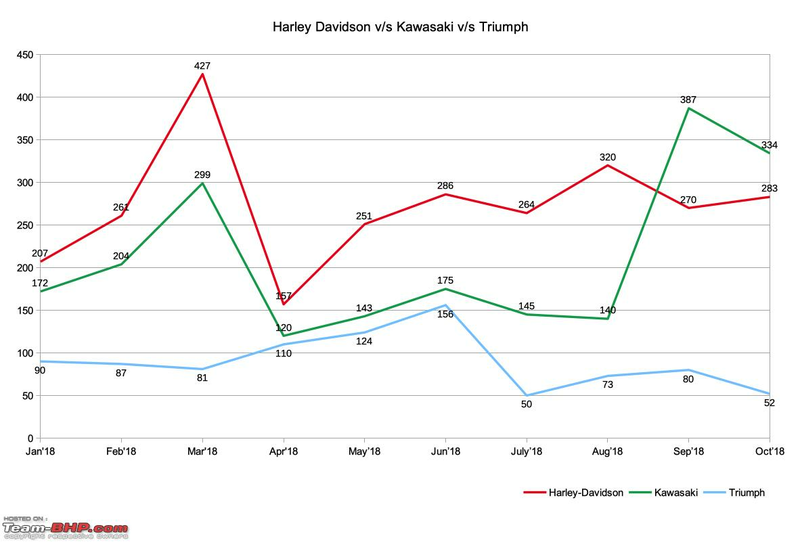 - Rough year for Triumph with their numbers all over the place. 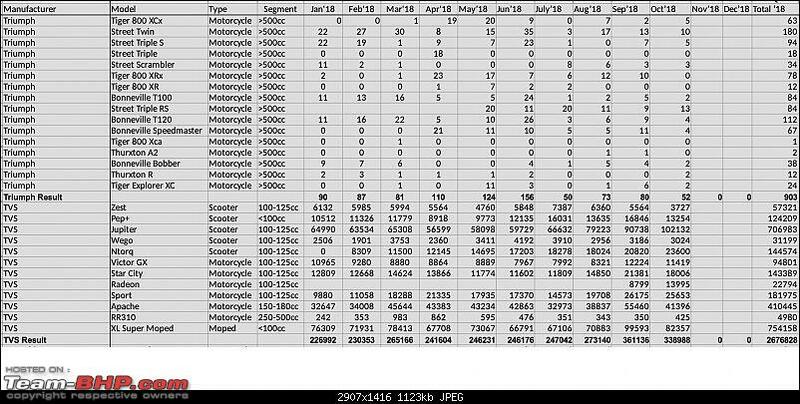 The expensive Street Twin is barely in double digits and even though the price difference between the two bikes is 3x, the Interceptor 650 is going to sway a lot of potential Street Twin buyers the RE way. 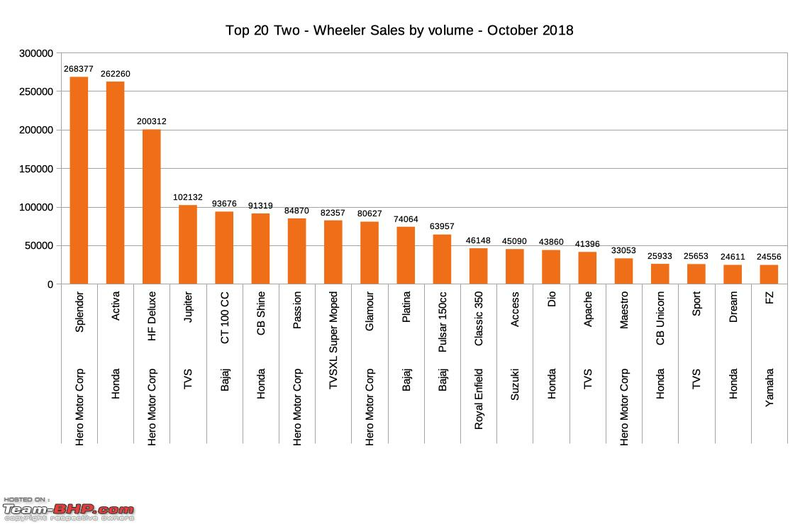 The Street Triple RS variant easily outsells the S again, which just goes to show how badly they messed up pricing of the new generation Triple. 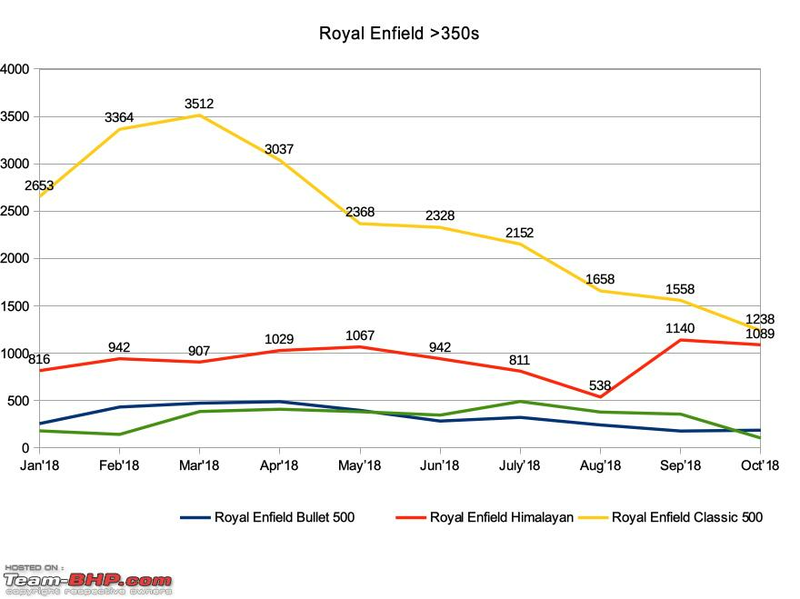 Troublingly, only 2 dispatches of Tigers for the month. 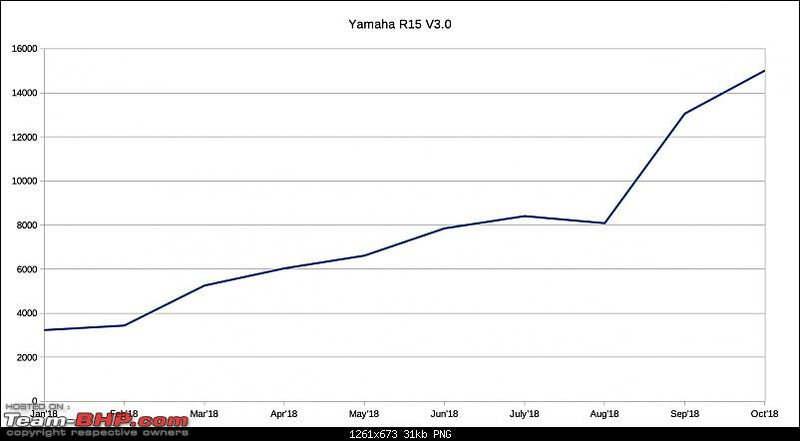 - R15 with very impressive numbers for the month. 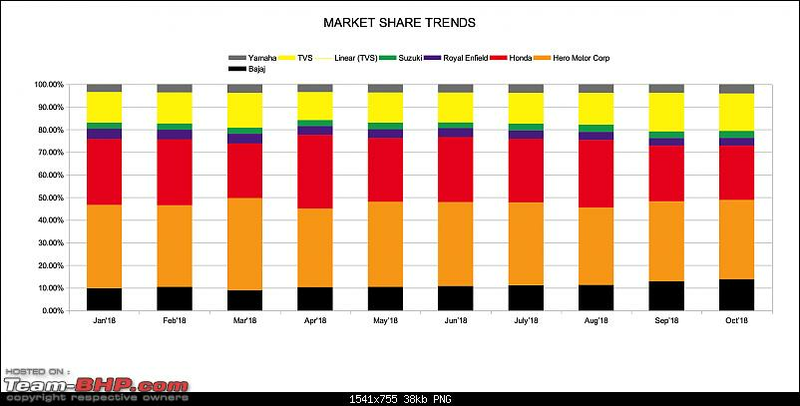 I see a lot of them, almost all in Yamaha blue though, here in Cochin. But still no ABS. 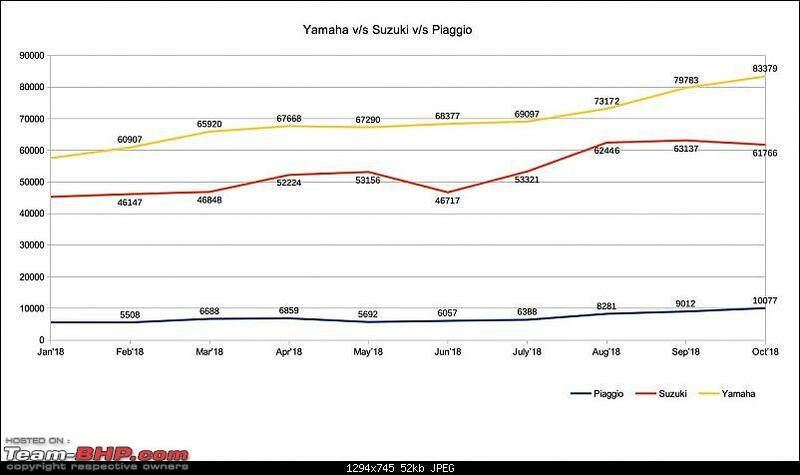 Imagine how much better the product and sales could have been had the wise boffins at Yamaha deemed to bestow the bike with ABS! 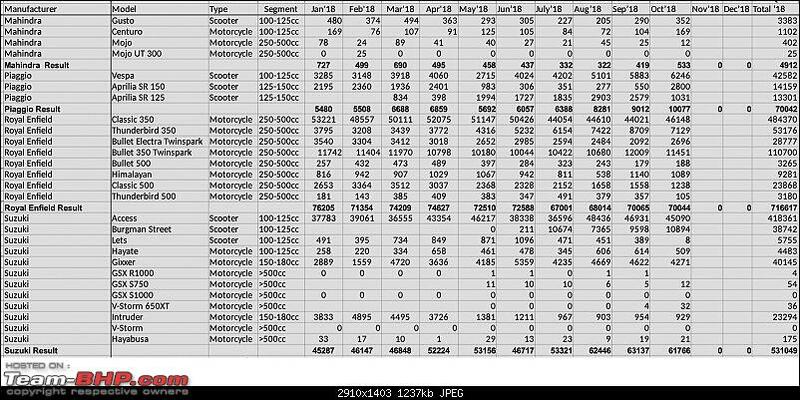 Best month of the year for the FZ25 as well. Last edited by neil.jericho : 25th November 2018 at 14:49. All times are GMT +5.5. The time now is 04:29.